Hello , few days back. I downloaded a supposed to download a torrent file, but instead i downloaded a boot strap file. I thought it would be harmless, if i run it under virtualization through Shadow Defender. But maybe it bypassed that virtualization and the system is infected with Desktoplayer.exe and userinit.exe Malware. Mant times i tried to used Malwarebytes, but it simply comes getting back. Please see the file. I don't know what to do, i tried Kaspersky Security, it simply doesn't install, all i have left is Malwarebytes and its quite not getting to the source. Does anyone know the solution or simply format the pc would be the solution. Any solution is greatly appreciated, at this time. Change default download folder location in Edge -Boot to a user account with admin status, select start > file explorer > right click on "Downloads" folder and select "Properties"
In the new window select "Location" tab > clear the text field box and type in or copy/paste %userprofile%\Desktop > select "Apply" then "OK"
Make sure Addition.txt is checkmarked under "Optional scans"
The tool will also make a log named (Addition.txt) Please attach those logs to your reply. @kevinf80: Thank you for your gesture. I did all you mentioned in the above post. After i had posted this thread, in 1hr time i had formatted by PC and restored the OS. I choose to format because i found these those thread which already mentioned about Ramnit virus, and the people choose to format their drive and start from scratch. But after 1/2 hrs the virus simply came back again.l can't believe this, it's very nasty virus, one of mine USB antivirus detected one of the file as Ramnit.R1 virus. Please see the picture. I would like to know your opinion. Its all messed up. 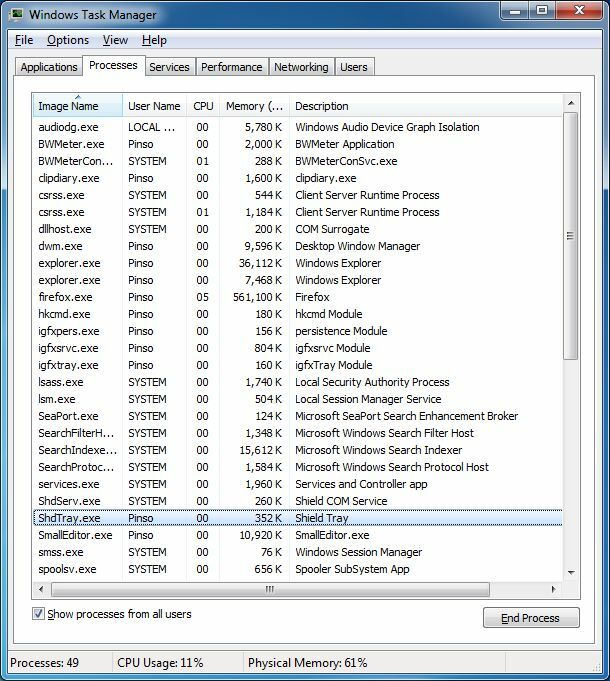 I use a program call Instant Recovery and it makes a system snapshot of Primary OS and makes another Secondary snapshot. From looking at the results, even that Secondary snapshot is infected. It wasn't an effective System Recovery tool. I'll choose Rollback Rx later. It's good i have so many backups, but this virus is very nasty and really irritating. I would wait your consultation. Here there are, just after running the tool. I had actually uploaded in the post above, if you could have seen in between the images. Here is another. Please download the log. When the Scan is complete Apply Actions to any found entries. Wait for the prompt to restart the computer to appear (if applicable), then click on Yes. 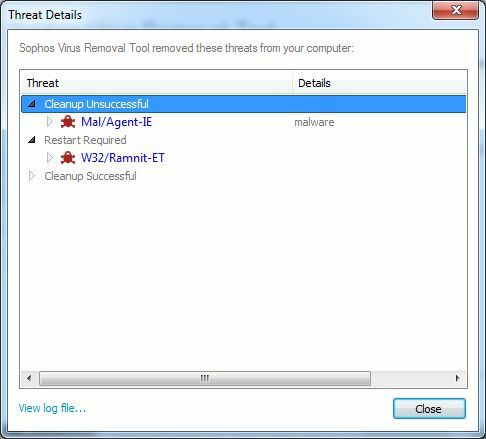 Sorry for replying late: actually Sophos Virus Removal Tool took quite sometime to complete because it was reading two OS's because of the program Instant Recovery. If it can catch any virus. Awaiting reply. When you`ve ran sophos and are at the threat details window did you select "View Log File" option, did that not produce a log....? The tool will also make a log named (Addition.txt) Please attach that log to your reply. Hello, i ran the Sophos tool throughout the day, switched between snapshot and did a scan by Malwarebytes and Sophos tool. I found out the Ramnit malware is gone, but the other malware or virus is still present. Please look at the picture. Actually there was the button to save the activity log in Sophos, but i was in a hurry to post the result. That was really stupid of me. I again ran the FRST tool. Really tiring to stare at the pc and fix. Every malware attack feels like new for me. C:\$ISR\1 Here (1) represents the snapshot of the current OS. How the malware transfer there is really puzzling, i cannot leave Instant Recovery, because i need to remove the virus, all of them, from both the snapshots. Then probably i will remove it and install some other program. Download Tweaking.com Registry Backup from here, and save tweaking.com_registry_backup_portable.zip to your desktop. Now we need to create a new folder to extract the zipped contents into. Right click on the zipped folder you just downloaded and select "Extract All". Click the "Browse" button and from the list, expand "Computer", then expand "Windows (C:)", and click the "Make New Folder" button. Call this folder something you will remember...like "RegBackup" then click "Ok", and then click "Extract". Type a custom name in Backup Name if you want, then choose Backup Now. If backup is successful, a message will appear at the lower half of the screen with an option to view logs. The registry backup will be created in %WindowsDrive%\RegBackup by default. You can customize the path in Settings. Close Tweaking.com Registry Backup when done. 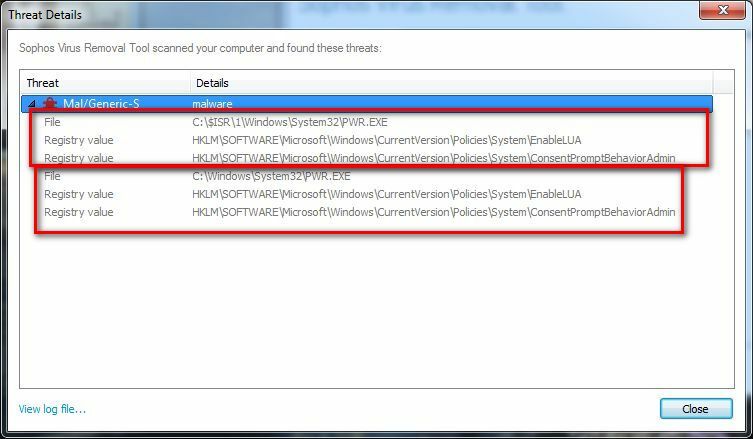 Select "Enable detection of potentially unwanted applications"
Don't forget to re-enable security software! Run FRST one more time, ensure all boxes are checkmarked under "Whitelist" but only Addition.txt under "Optional scan" Select scan, when done post the new logs. "FRST.txt" and "Addition.txt"
Please wait til tomorrow, i will leave it whole night for online scan. It might take a while. I did remove Instant Recovery and formatted the c:\ and 100 MB partition that Win7 usually makes during first time installation. I restored the pc but still getting same results by Sophos. Please see the picture, i havn't deleted it yet, i'll leave that to online scan. Please wait , it might take a while. 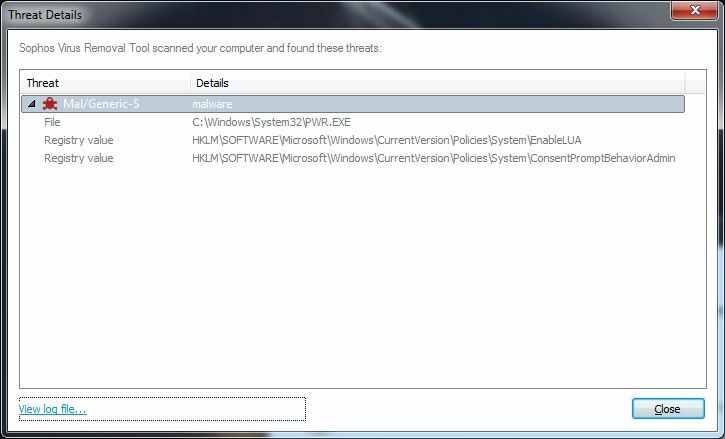 Hello, after my last post i tried scanning with a few programs like SpyHunter and few Registry editor (RegClean Pro Here ) and the spyware or programs poped a lot of false positive results, i was again scared to mess with those. So lastly i removed the other snapshot, booted from a Win 7 pendrive and did a format in all the partition then used a program called Active@ Boot Disk (Active Boot Disk), its a multi-utility program. Then i went to Active kill disk (Active Kill Disk); i choose to wipe the disk drive; partition after partition( i had already copied all the file present in D: & E: to Ext. Disk). I thought it would completely wipe the disk at sector level. 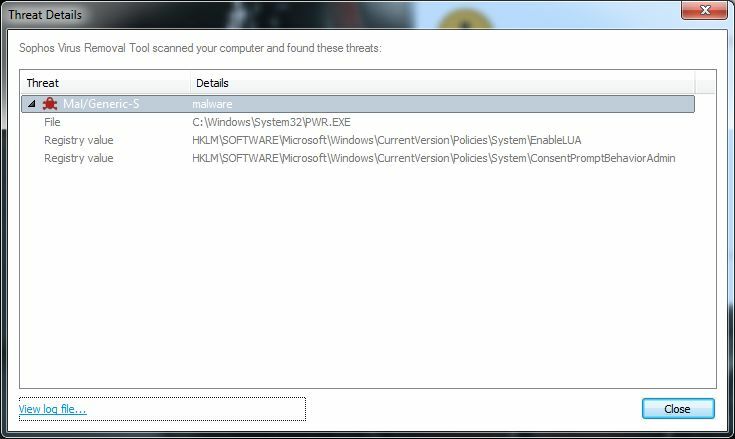 So again i restore the pc and did a full scan with Sophos, their again it showed a malware with the name pwr.exe and two registry entry. Please see the picture. I can't believe it, its like this virus survived a nuke attack. I have had good results with Active Kill Disk. I am out of ideas and maybe i will have to use my pc with this virus or malware. I can't choose to perform Low Level Format using WD Diagnostic tool, writing 0's in the disk just for a single virus. I think doing so, will degrade the HDD and probably will crash very very soon. I have already trashed a 320 GB WD Disk and this is 1 TB WD Disk, which i just recently purchased it. If only you could suggest something really good. Awaiting reply. Copy and paste the results back here please. I will try to get deeper and report back as soon as i can. Open Notepad, select "Format" from the menu bar, make sure "Word Wrap" is not checked. Copy the text from the code box below to Notepad. 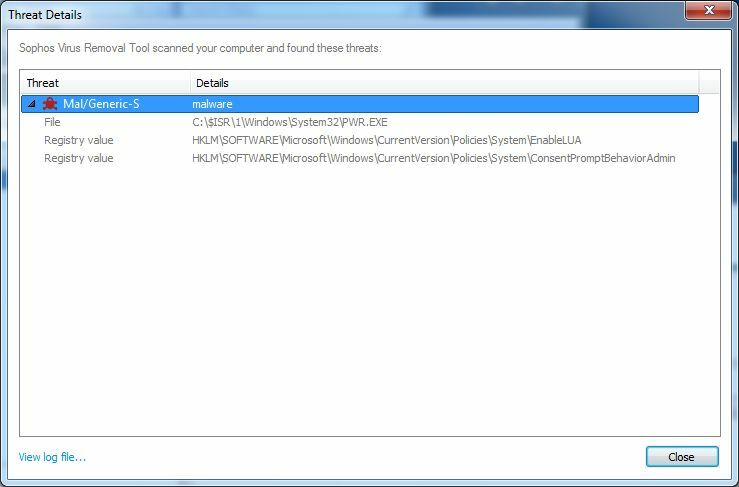 del /f /s /q "C:\Windows\System32\pwe.exe"
If you are using saved images to reinstall windows then those images are likely exploited and will be no good. Are you able to make a fresh install from an installation disk? Hello again, your bat file removed it, so would have Sophos, i didn't remove before because i wanted go deeper. But it didn't work. 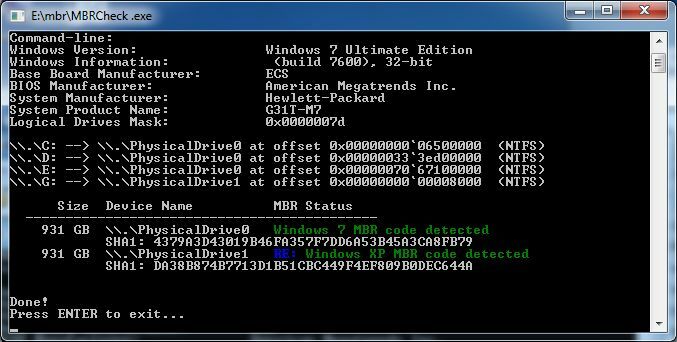 of MBR viruses messing up by certain pc. 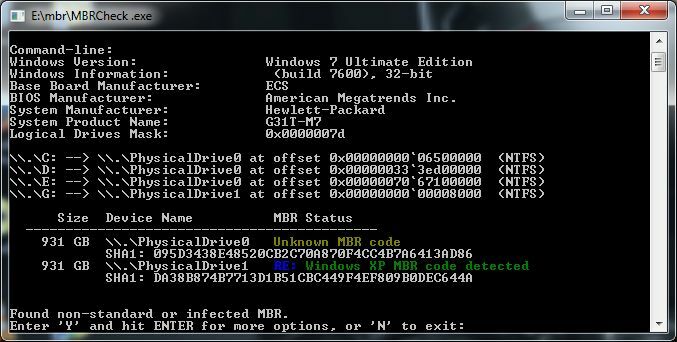 So, i thought of nuking the WD Disk or LLF one time, hope that is enough to remove the mbr virus or any nasty virus. The reason why i say mbr virus is because everytime i open Firefox a page openup. technologyto.com this page opens up. So i'll be writing 0's and restore , start from sratch. i tried a lot of tool rootkits program, MBRcheck v.1.2.3 etc, but I will report back when its all done.. Please see the picture, all the processes and services doesn't appear at once. Something is definitely consuming memory. Let me know how you progress, also what you want to do next.. Run the following if possible. Please download aswMBR ( 4.5MB ) to your desktop. Double click the aswMBR.exe icon, and click Run. Hello, last night i did a LLF writing 0's on to the disc ( no virus can survive that ! i think so) , i used the tool from WD website that runs on Dos. After that i used Win7 bootable USB to load the OS , then restored an old image on top of the OS, and it booted to windows. However that was not all, i tried to install Vega Pro 11, they had their own keygen, and i used that. Now i am thinking that keygen or patch had a virus. So i immediately restarted and formatted that parition and restored it again. Maybe some amount of virus may have transferred from the patch. 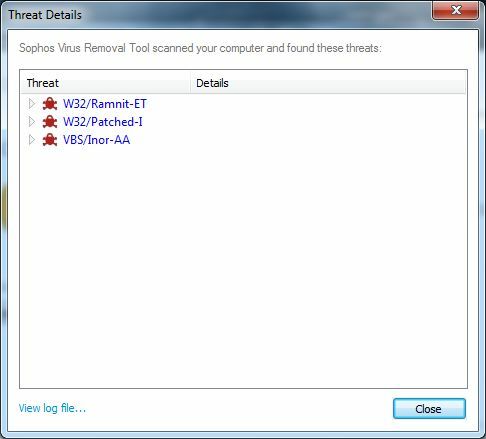 I did a scan by sophos again n it showed the same virus. I removed it. I downloaded few mbr tools, aswMBR was one of them. 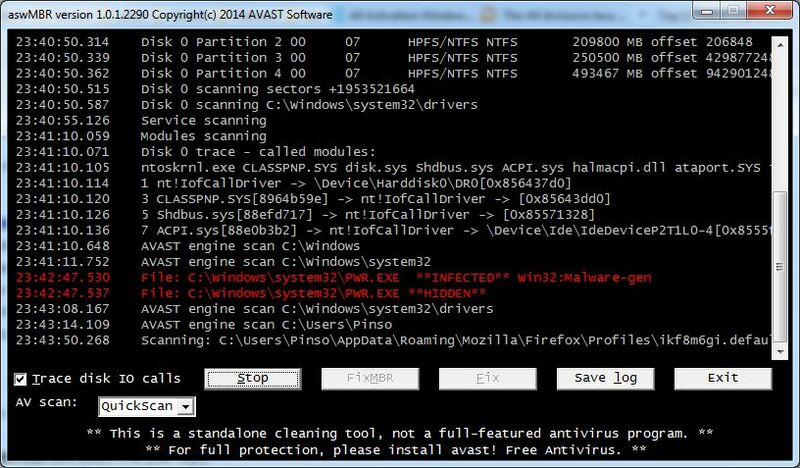 It did a scan and found two virus: please see the pic. The virus matches, also i uploaded the file aswMBR made after scanning. 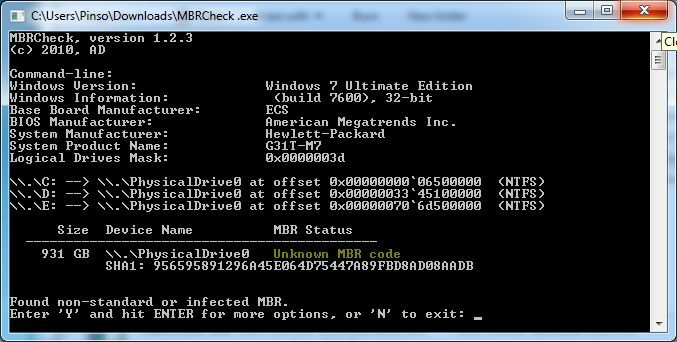 I also used mbrcheck 1.2.3 and there it showed different os entry. The picture where you see, " unknownbr code". i think it is detecting Rollback Rx and below is the xp entry. If i remove Rollback RS , you'll see both the entry of Win 7 and XP in green. 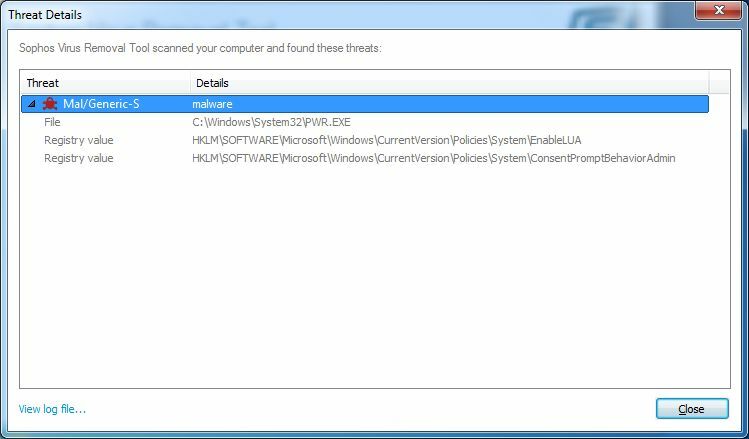 I already advised against using any previous image backups, that nemisis file PWR.exe will always comeback and catch you out... aswMBR should also have saved MBR.dat to your desktop can you zip that up and attach it. I already updated that file. Press Ctrl f copy/paste aswMBR 1.0.1.2290.rar . Its already tthere. Hello, today i did another LLF and made parition and restored through an image. I had made three images, one made from Win7 default backupper , another by Acronis 2014 and other by Ghost 15. Win 7 backup and Ghost 15 image didn't work but Acronis image worked. Surprisingly it worked. About the c:\windows\system32\pwr.exe virus , i am thinking the virus must have probably been in the image all this time. So i will format and install from the start and scan with Sophos and post my log file here. I didn't want to delete or loose the image file because i have a lot of software already installed, and how much time consuming is to start from scratch. Will let you know, in few days.